To celebrate the upcoming Shoreline Treasures release we are offering you the chance to win these brand new papers! All you have to do to have a chance to win a complete collection of Shoreline Treasures in 12×12″ and 6×6″, is to leave a comment on this blog post, telling us what you think of this new paper collection. This giveaway is open for entries until Sunday March 2nd and we will randomly choose a couple of winners that will be announced during next week. Make sure to share the news of this giveaway in as many places as possible, becuase the more comments we receive, the more winners we will pick! The patternes, and the bluetones… Abselutely stunnning. I love it, what a beautiful new papers and give away !!! Ooooh, these papers are simply gorgeous. I love the soft colours and the feeling of summer. Pion er min absolutte favoritt ! Shoreline Treasures is just beautiful! Love the papers, so lovely colors and pattern, and the image are super cute. Wow, these papers are so beautiful. I love them! Thank you for the chance to win them. Ook, what a lovely colours and design, so soft and sweetdeal. I am sure I know hoe to ” deal” with this :). Stunning papers , I love the sea and the shoreline! We always spend our holidaysby the sea, love to make an album with those pretty papers! Lovely papers, and I love the fact that you make papers that works equally well for men or women and also the fact that the papers that are more for men are NOT brown, grey or khaki etc like other papermakers papers. What a super cute papers are these!!!!! De er simpelthen super over kodyl fantastiske. Jeg er bare totalt vild med dem alle sammen i deres virkelig smukke blå nuancer, som er sååå fantastisk flotte. I just so love this new paper line. Would love to win this new collection. Love this paper, hope it comes out in the shop soon ..
Oooooooh, what a lovely, rustic, charming and sea feel like paper! very beautiful!!! It´s a lovely collection and gives a great sense of peace. Oh my word this is a stunning collection and thank you for the chance to win…I’ve shared this on facebook. What a great way to make possible that one can make such wonderfull designs. Also this time a am very pleased to see the beaUty of the sea live. It thrills me to the “fishbone” to work with these beautifull papers. Time affter time……. Keep up the good way and as I say in French “CHAPEAU”. Itsnbeatiful as all your papers are. Vert Munch summer, lest hopeNfor anbod one. Ooooooo, this is so beautiful!!!!!! Such a beautiful blue’s !!! And the tags looks amazing! Nyydelige papirer!! Får skikkelig sommerfølelse. Disse skulle jeg gjerne hatt..
Håper jeg er en av de heldige som vinner! 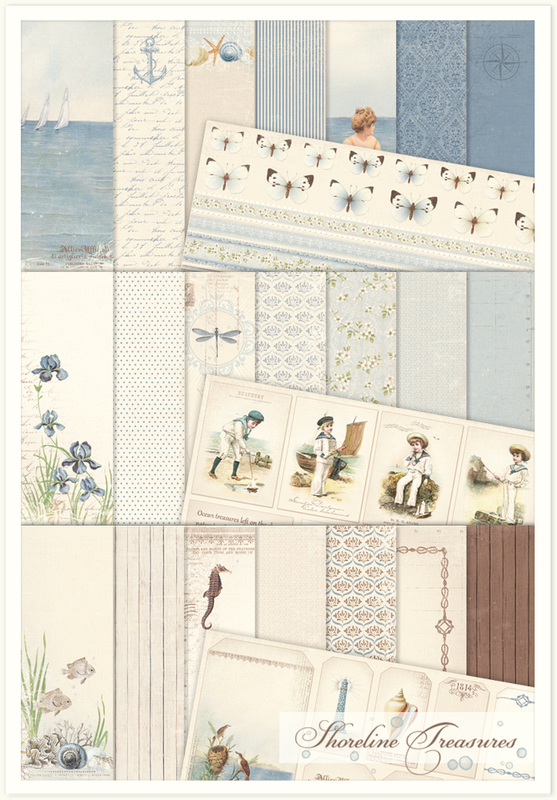 This is such an amazing newe paper collection..love it..
I’m a big fan, allways buy all the new papers and often use them on my cards..Would really like to win this papers..
Fantastiskt vackra papper, härliga färger och fina mönster. Gillar den härliga känslan av vintage, sommar, sol och hav! Hoppas på turen att få vinna denna underbara kollektion! I feel the scent of the sea looking at this collection. Beautiful. My family has a summerplace out at the Finnish archipelago and we spend all vacations by the sea. At winter I miss the sea and I dream about summer. I’m scrapping all the precious summer memories. Shoreline treasures is a perfect collection for my work, vintage, dreamy and maritime. Can’t wait to get creative !! Wow, I love all the Designpaper from Pion, this looks so great again, there is comming up a lot off inspiration when I see this paperfragments….Love it, and I love the change to win. As always NEVER disappointed with Pion paper. love it and would be fun to work with! What is The Shoreline Treasure collection a beautiful one. Exactly the colors and style I like so much. I already know which photo’s I want to use to make à wonderful scrap and cards. I can hardly wait. Ohh..wauw, wat een supermooie serie is deze weer. Ik hou van maritiem en van Pion Design! Het zou geweldig zijn om deze serie te winnen. Absolutely love these papers! My mother was from RI, and my dad was a Navy man. I lost both of them last year and these papers would be perfect for an album with their pictures. Of course, I would have to make 3 of them for each one of us kids! Your papers are always so lovely and nostalgic. Thanks again for this opportunity. Wow that was strange. I just wrote an really long comment but after I clicked submit my comment didn’t show up. Grrrr… well I’m not writing all that over again. I think this is among the most significant information for me. really informative. I am going to watch out for brussels. I will be grateful if you continue this in future.